Mary Elizabeth Bryan Faucett, age 62, of Knoxville passed away Saturday, October 20, 2018 at West Hills Health and Rehab after a long battle with complications of her diabetes. Mary was born on February 12, 1956 in Sherman, Texas to born Riley Maurice Bryan and Lucille Metcalf Bryan. She graduated from Sherman High Class of 1974. She worked as a nurse at the Knoxville Dialysis Center. Mary liked pink and Pink Floyd! She enjoyed dogs, family, and listening to music on her Alexa. She is preceded in death by her parents. 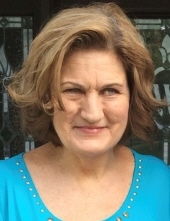 Mary is survived by her son, Darrell Faucett of New Braunfels, Texas; daughter, Kristen Faucett of Knoxville; grandchildren, Caleb, Katelyn, and River; brothers, Max Bryan and wife Linda of Garland, Texas and Joe Bryan of Pottsboro, Texas; sister, Rebecca Smith and husband Gary of Nashville. The family will receive friends from 4 to 5 p.m. on Thursday, November 1st at the Click Funeral Home Middlebrook Chapel with a Celebration of Life to follow at 5 p.m. with Rev. Don Thomas officiating. To send flowers or a remembrance gift to the family of Mary Elizabeth Faucett, please visit our Tribute Store. "Email Address" would like to share the life celebration of Mary Elizabeth Faucett. Click on the "link" to go to share a favorite memory or leave a condolence message for the family.